Manet was a great admirer of seventeenth-century Spanish painting. 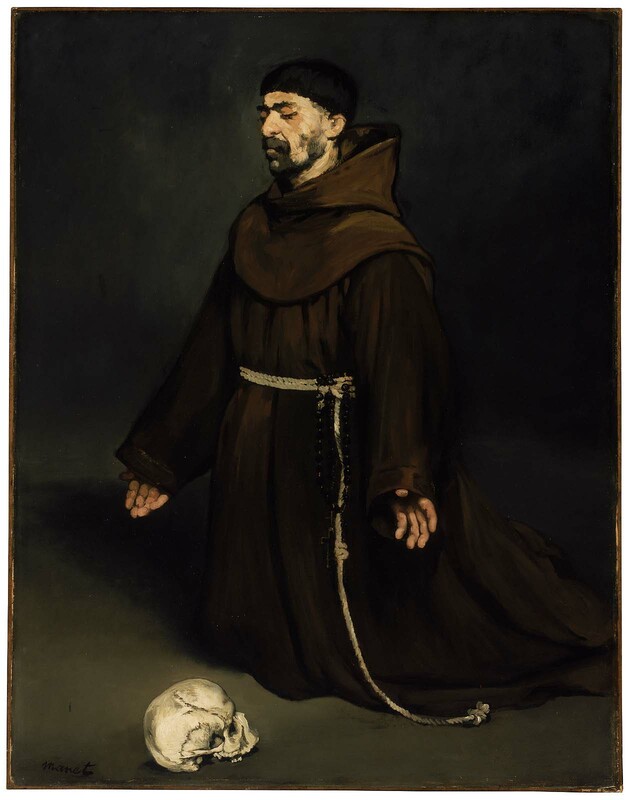 This work may have been inspired by Zurbarán’s “Kneeling Monk,” which Manet could have seen at the Louvre. He was also much impressed by the masterful handling of dark and light tones in the work of Velázquez. A. Tabarant, Manet et ses oeuvres (Paris, 1947), pp. 103-104. Bernstein was a friend of Manet and father of the playwright Henri Bernstein. In a letter to the MFA (April 17, 1940), Blanche wrote that after the artist's death (in 1883) he received this painting from Bernstein in exchange for a small landscape by Daubigny. The painting was still in Bernstein's possession in 1884, when he lent it to the Manet exhibition at the École des Beaux-Arts, Paris (cat. no. 25, "Un moine en prière"). He probably exchanged it with Blanche shortly afterward, though it is first documented in the Blanche collection in 1902; see Théodore Duret, Histoire d'Edouard Manet et de son oeuvre (Paris, 1902), cat. no. 62. Letter from Jacques-Emile Blanche to Jacques Furst of the Marie Sterner Gallery (January 31, 1935) (Archives of American Art, Marie Sterner letters). The gallery had first offered it to the MFA in 1934.